Are you vacationing at Walt Disney World Resort and looking for a memorable and most magical dining experience? 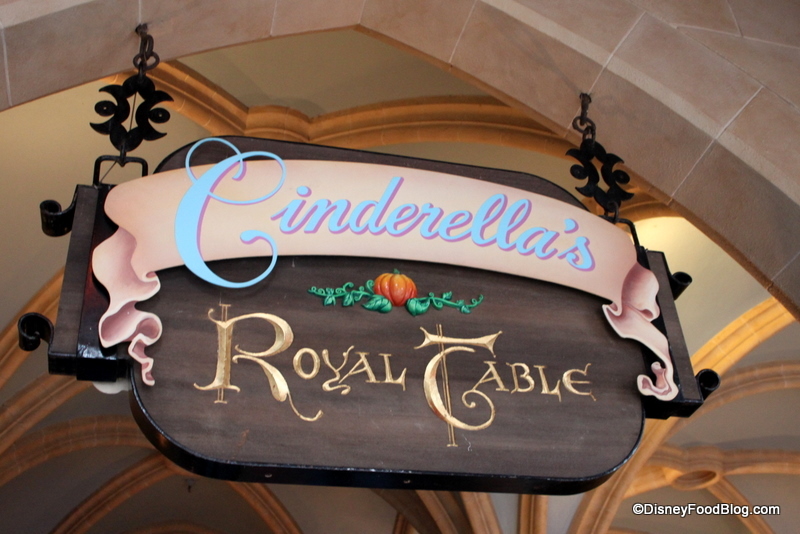 Today I thought I would share with you my thoughts on dining at Cinderella’s Royal Table! In fact, it just so happens to be one of my favorite dining experiences in all of Walt Disney World Resort. 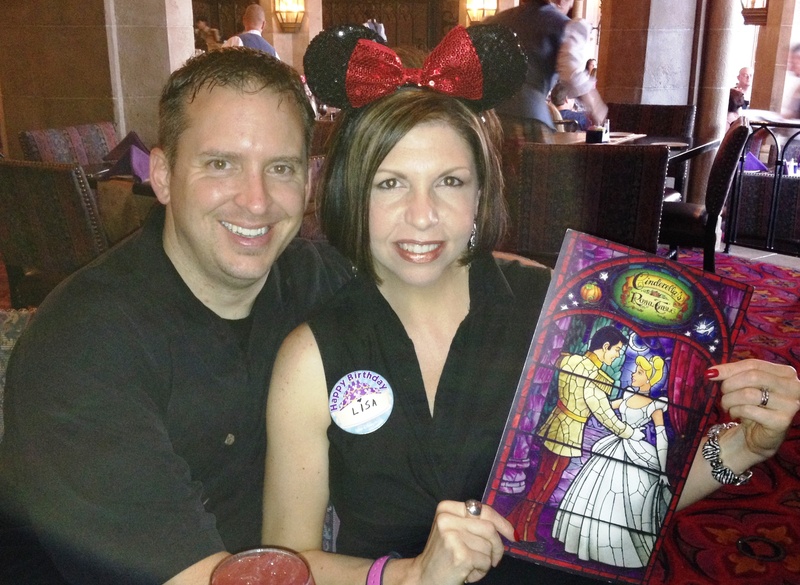 (So much so that when many of my friends headed off to Vegas for their 40th birthday, I chose to dine in Cinderella Castle instead!) Whenever a friend or family member is planning a trip, it is my must do restaurant recommendation, especially for first time visitors. From the moment I walk down Main Street in the Magic Kingdom, Cinderella Castle beacons me. Perhaps it is because I dined there on my honeymoon, or because I have introduced both of my princesses to their favorites there? But to me, there is magic in the Castle. And what better way to explore it than to reserve a table in the majestic Banquet Hall for you and your family to see for themselves! Whether you choose breakfast, lunch or dinner, you just cannot miss out on this amazing dining experience. Here are my 10 things you need to know! You need to plan ahead, most likely 180 days ahead. Upon arriving to Cinderella’s Royal Table at your designated ADR time, there will most likely be a bit of a wait (as it is with most Disney restaurants.) Then once called inside, you will enter a beautifully medieval themed Grand Hall to meet Cinderella. At that time you and your family can ask for autographs, chat with the famous princess and then have your photograph taken. (The photos will be added to your My Disney Experience Account as the printed photo packages have been discontinued. )You are also encouraged to explore the Hall which boasts a huge fireplace that is flanked by crests of nobility. Don’t forget to look up; there are several little surprises to uncover throughout the room. This entire process takes somewhere between 15 and 45 minutes, in my experience, but could take longer during peak seasons. You will be immersed in a medieval castle setting; it’s more fun if you play along! Don’t rush climbing the spiral staircase when your name is called. The grand staircase is to be “ascended” one red-carpeted step at a time, and certainly not in a hurry. How many times in one’s life do you get to climb a spiral majestic staircase case and peak out of beautiful stained glass windows? (There is also a gilded elevator available to transport you as well.) Before you head into the Banquet Hall though, stop and peek at the view of the Grand Hall below and look at the amazing view. It’s breathtaking. Now that you are ready to enter the dining area, stop and look around. From stone Gothic archways, leaded glass windows, banners with coats of arms and views overlooking Fantasyland- every detail is meticulous. It’s pricey, but worth it! Photo: Me and my hubby during my 40th birthday day dinner! The menu is prix fixe. Although the menus change periodically, the one constant is that you will be given a menu with a fixed number of categories and you make selections from each one. Since the price is per person, there will be no surprise coming your way when the check comes! Also, you can easily find the menus online to make sure you won’t be disappointed in what is offered. 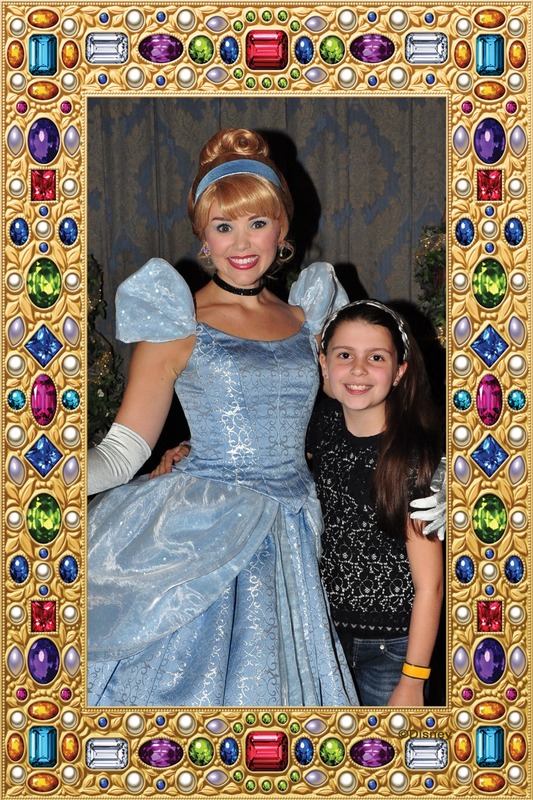 CRT is considered a character meal; it is one of the best ways to meet many popular princesses. One of the biggest reasons I think CRT is splurge worthy is there is no time spent waiting in line for princesses! Although there is no guarantee which princesses you will see, each time I have gone there have been at least five and they have included: Aurora, Ariel, Jasmine, Belle, Snow White and of coarse, Cinderella! Others have also seen characters such as Mary Poppins, Suzy and Perla and the Fairy Godmother herself! Think about the time saved having these characters come to you, as opposed to you waiting for them! And let me say, they are all wonderful! On our last trip Ariel tried on my daughter’s Glow With the Show Ears and acted like she had never seen such an amazing device. She must have spent 10 minutes trying them on and making us laugh, I don’t think we have ever spent that much time with any character in the park! Why dinner is my favorite! Cinderella Castle is magical any time of the day, but there is something amazing about it lit up at night. My opinion is that if I am going to splurge on the experience of dining in the castle, I want it to be the most amazing memory I can have. And there is something special about dinner. The candle light, the elegance, it all just seems a bit grander in the evening. Now, if you are lucky enough to experience CRT every trip, I say, mix it up! But if this is a special memory you are making, as it was for me on my 40th birthday, then I say, do dinner. As a bonus, you may even catch a fireworks view depending on what time you eat dinner! Speaking of celebrations, Cinderella’s Royal Table is the perfect place to celebrate! Whether it’s a special birthday, a wedding anniversary, or anything worth celebrating, let your server know! They love to add special touches to your meal at CRT. Also, you can order special personalized cakes and other items to be delivered to your table by contacting https://disneyworld.disney.go.com/celebrations/customizations . Lastly, there are princess and engagement packages you can add once you have made your dining reservation, go to https://disneyworld.disney.go.com/dining/magic-kingdom/cinderella-royal-table for more details. Cinderella’s Royal Table is fun for boys too! During my meals at Cinderella’s Royal Table, I have seen countless boys, even grown ones, enjoying the experience and visiting with the characters and princesses. From suits of armor, to the grandeur and magic of it all, the experience definitely appeals to a wide audience. And to add to the magic, each child is given either a magic wand to cast a spell with or a light saber to defend a maiden! However they use their gifts, they are a highlight of any child’s day at Walt Disney World Resort! So there you have it, my 10 things you need to know about Cinderella’s Royal Table. 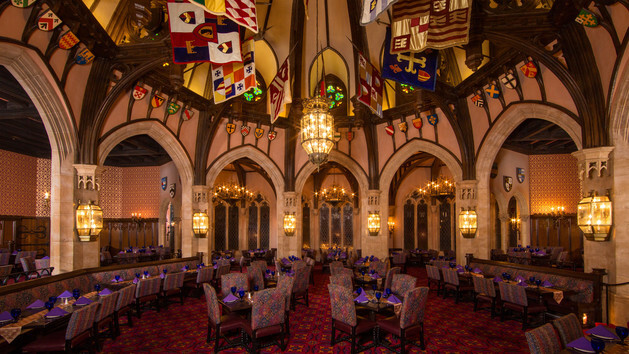 From the magic of exploring the castle, to interacting with the characters and enjoying the dining experience, I am positive that dining at CRT will be an experience you’ll want to try at least once! Lastly, if you are debating between Cinderella’s Royal Table and Be Our Guest, I highly recommend both! They are different experiences and really cannot be compared. So if your vacation allows, by all means, go see the Beast too! We recently booked a trip to Disney. When do you suggest is a good time to have dinner at the castle? We would like to watch the fireworks from either inside the castle or right out front of the castle. I was a cast member 13 years ago. I worked a couple breakfast shifts at CRT in entertainment. During that time there was no Princess meal at Akershus. I always felt VERY rushed at CRT to get to every table and felt I wasn’t able to have the quality time I wanted. They gave me a strict time limit. We can only afford to do 1. Which should I do? Do they do a princess parade at the castle? Did you feel like they were rushed at the table? I would choose CRT, I love the magical element, but will I be sacrificing more 4 yr old fun? Hi Caytie! I just love meeting cast members, past and present! And I’m excited for your trip! Unfortunately however, I have not dined at Akershus. But I did do a bit of research for you. Let me start by saying that I think you can’t go wrong with either choice, both will provide princess interaction, a little disney magic and a pretty darn good meal! Here are some differences though: CRT is a sit down meal while Akershus is a buffet, and my experience with the buffet along with character dining is that things can get a little chaotic- and if you are at the buffet and miss a princess you have to wait for them to come back around. My preference would be sit down for that reason. That is just my opinion. Cinderella greets at CRT while Belle greets at Akershus, if your princess is a big fan of one or the other that might weigh in on your decision making. I have heard the food is amazing at Akershus, but every meal I have had at CRT has been fantastic, and I have not experienced Akershus so I can’t offer an opinion there. But at CRT your little knight would get a sword and he might think that is pretty cool, while Akershus has the princess parade where I have not seen that at CRT, and that sounds really fun! All in all, it’s a tough choice. 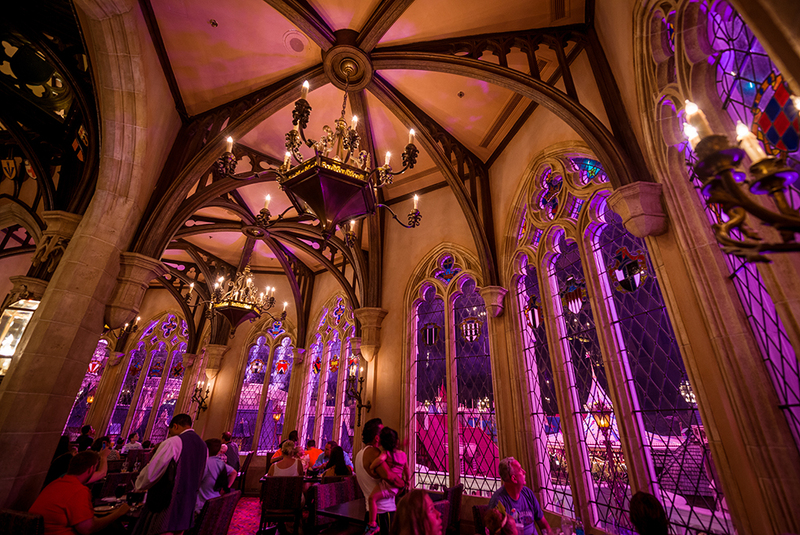 But since I’m a big fan of CRT and there is just something magical about dining in Cinderella Castle I would lean that way, unless one of the above factors really sways you to Akershus. Again you really can’t go wrong, please let me know what you decide and how it went! We are going to disney and eating at CRT Oct 5th for dinner. On this trip my husband and I are celebrating or 10 year anniversary and it’s everyone else in my family’s first time to disney (my 4th). Should I still mention the anniversary to CRT even if it’s just myself and my two daughter’s eating there for a girls night that night. My husband and son are doing guy things together that night. Hi Courtney! Congratulations on your 10 year anniversary! While checking into your resort or at any customer relations kiosk ask them to give you a celebration pin commemorating your anniversary! This way, you won’t have to say anything- cast members will know you are celebrating regardless of who is in your dining party. However, it would be up to the cast member if they chose to do anything extra or magical, but that is part of the fun! If you and your husband are dining somewhere special and you want to make sure it’s recognized, I would call the restaurant and request a special dessert ahead of time. I hope that helps! Have a wonderful time, and let me know what you think of CRT! Hi, great post! For our family to get last minute reservation at CRT we had to buy tickets for the Halloween party. The party rules state no dresses allowed that reach or drag on the ground. I was planning to keep my gown on and head straight to the castle for dinner but if i need to change into the gown beforehand, is there a clean bathroom or changing area near the castle? My Resort is art of animation and was told that’s at least an hour away, not possible for us to go back and forth. Or is a shiny gown and shawl too dressy for an adult? TIA. I just reviewed the guidelines for regular admission to the park which states that no one over 14 should be wearing a costume. What type of “gown” do you plan on wearing that day? I’m concerned that you may not be able to wear it all, so I’m hoping you’ll elaborate. If it indeed drags the ground but you are allowed to wear it during the rest of the day, you may want to change per the MNSSHP rules. Typically the cleanest and least crowded restrooms closest to CRT will be those near Gaston’s Tavern in Fantasyland. I hope this helps! And also, I hope you enjoy Mickey’s Not So Scary Halloween Party, it is my favorite event in all of Walt Disney World Resort! Your plan sounds absolutely magical! Some thoughts I have would be to recommend a FastPass+ reservation for Enchanted Tales with Belle if possible, and since the kids will be all dressed up, go see Mickey at Town Square Theatre for a photo! Make sure to grab a Disney PhotoPass photographer for a picture in front of Cinderella Castle as well, and one at the entrance to Magic Kingdom! Regarding an ADR to Cinderella’s Royal Table, I would leave 2 hours total for the experience to be absolutely safe. First off, any ADR time at Walt Disney World Resort is not like your typical dining reservation, at many restaurants you will not be seated for your meal the moment you arrive. At CT especially, you are immediately whisked away to meet Cinderella (which usually has a small wait time) and then you are escorted to the royal dining hall to be treated to an entire procession of princesses while you dine. In addition to the enjoying the amazing meal, you’ll want to leave plenty of time to snap pictures and get autographs, therefore I think 2 hours total is a safe bet. To make a 9:00 Wishes viewing, I think a 5:30-6:30 ADR time will allow you enough time to find a great viewing location as well. I hope you have an amazing time Monica, please let me know if you have any addition questions! Also, please like my DisTripQueen Facebook fan page for additional tips and updates! I am trying to make reservations on line for the castle; however, it has proven futile. I’m going in November and I still can’t manage to get a reservation for lunch/dinner. My question is why doesn’t Disney have another full service restaurant like the castle in the magic kingdom? We don’t want cafeteria style. After all these years Disney should realize that you need another full service, nice restaurant on the same style of the Royale Table at the castle. I am a bit disappointed. Hi Lynn! Be Our Guest would be a great alternative, you’d be dining within the Beast’s Castle from Beauty and the Beast, it’s wonderful! Unfortunately it’s also a very tough ADR to get unless you are able to grab one 180 days out. Here is what I would do, I would book an ADR at Tony’s Town Square Restaurant which we quite enjoy (or another sit down option in MK) and then about 48 hours before you plan on dining try using the My Disney Experience app every couple of hours to see if anyone has canceled and an ADR has opened up. People tend to cancel before their 24 hour window to avoid the cancellation charge and I have had good luck getting last minute ADR’s this way. Keep your back up plan just in case it doesn’t work out, but if it does be sure to cancel so you don’t get charged if you are able to switch. Another option if you want to see Princesses is to try Akershus Royal Banquet Hall in the World Showcase at Epcot! You should have better luck scoring an ADR there. Please report back and let me know how it worked out, good luck! how early should you show up for your reservation at CRT? Our reservation isn’t until 8:30 as that is all we could get, but we also really wanted to see the fireworks show which doesn’t start until 8! Hi Iaryn! Disney recommends that you arrive 20 minutes prior to your ADR time, no later than 10. Have I cut it closer than that, yes- but CRT is such a hard ADR to get, I wouldn’t recommend risking it. With that said, without knowing the date of your reservation I can’t say for sure what time the fireworks start, but usually they are 9:00pm. If that is the case you may want to arrive early and say that you would be willing to wait for a window seat- if you are able to get a table close to the windows you will not only get a great dining experience, you’ll be able to see the fireworks from your table as well! Check back with me and let me know how it turns out, thanks so much for reading my blog! it’s so helpful to read all your experience at CRT. But one thing that i’m still curious is, u’ve said that the price is fix for per person. And my question is, is tat a buffet or alacarte meal? Or it’s like a buffet which we can order whatever we want to have. I’m just about to make a reservation for two and they asked me to pay $158 in advance. Thank you for reading my message and looking fwd to hear from you. I hope to see you around my blog in the future, I am working on updating my content and adding some new experiences soon! Be sure to subscribe! And if you have any other questions regarding your upcoming trip feel free to email me at distripqueen@gmail.com. So, it’ll be a lunch set instead of buffet and I can choose one of the items from appetizers, main, and dessert. Have a magical day to you too! We have a ADR at CRT on November 1 at 8:30 pm. Is it possible to ask for a window table? When would I go about doing this? It is both my daughter and granddaughter’s birthdays. That would make it even more magical! Thanks! Thanks for stopping by the DisTripQueen blog! 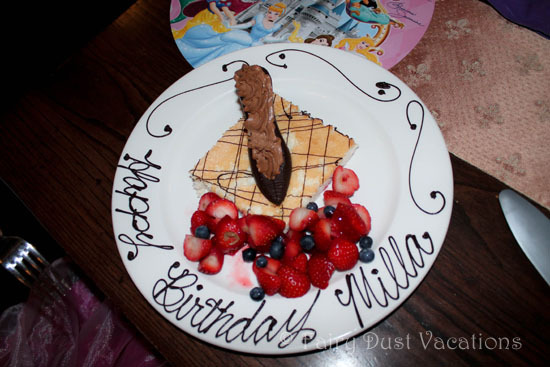 When you made your Advanced Dining Reservation, did you happen to mention you would be celebrating birthdays? If not it might be worth a call to let them know ahead of time. The number is 407-WDW-DINE. (When you check in make sure to remind them as well.) As for securing a window seat, you can ask for one but they are not guaranteed. Your best bet will be to arrive early, I’d suggest 30 minutes at least. Be super nice when you check in and explain that you would love a window seat and you would be willing to wait extra time if it would be possible. I can’t guarantee magic will happen, but Disney is known to spread extra pixie dust on occasion, especially when guests are super nice and willing to wait a bit! If however you are not able to secure a window seat, rest assured, you will have a magical experience regardless. The entire restaurant is visually stunning, and the entertainment is amazing! You won’t spend too much time missing that window, I promise. However, my fingers and toes are crossed for you! Please come back and let me know if it worked out for you! I would love to hear about your experience! We have a 9;40 reservation at CRT on a day when fireworks is at 9:00. How easy would it be to get to the castle after watching the fireworks? You may find it pretty difficult actually, my recommendation is to stop by the desk at CRT earlier in the day and ask what their recommendation would be. They usually block off all areas around the castle during Happily Ever After, but they must have a plan in place to accommodate guests with ADR’s. If you wouldn’t mind reporting back here as to what they tell you I would appreciate it, I reached out to several people in the know about all things Disney and even they were unsure! Hi Lisa, I made an ADR at CRT next month for 8:10AM for my family of 4. My parents then decided to join my family for vacation but I was not able to add them to my existing reservation at CRT. However they were able to get a reservation for 2 for the same day at 8:30AM. How likely is it that Disney will seat us all six of us together for the meal? When I called Disney dining they really couldn’t answer my question. Thank you! What a great question! I unfortunately don’t have a black and white answer for you, especially since Disney dining didn’t seem to either. However, I do have a few suggestions. If you are staying onsite, upon check-in at your resort, go to guest services and explain the situation. Usually your chances of getting pixie dust sprinkled on you is much greater in person and with a pleasant attitude. If they don’t seem to be able to help you the next best bet is to stop by CRT if you can the day prior to your ADR. Usually reservations tend to open up because of cancellations and also again, in person and with a pleasant attitude might get you the result you want. You could also keep checking online for a reservation of 6 within your preferred window of time up until the day before, you might have good luck because of cancellations that way as well! I hope it all works out in your favor, have a wonderful time at Walt Disney World!